OBJECTIVE: To determine outcome of early (<72hours) surgical intervention in subaxial (C3-C7) cervical spine injury through anterior approach among adults. The ASIA impairment scale is a validated tool to describe a patient’s functional impairment as a result of their cervical spinal cord injury (attached as annex).The principal investigator will determine it by physical examination of patient and assign grades as complete (A), incomplete (B, C, D) or normal (E) on date of admission and on completion of 2 months. Finally outcome will be assessed as good and poor. Good: May have improved up to grade D or complete recovery grade E.
Poor: Moderately disable, not to perform daily activities independently or have neurological deficit, will be graded as either A, B or C.
SETTING: Department of Neurosurgery at the Jinnah Postgraduation Medical Centre Karachi. • n=Sample size came out to be 50 patients. D: Incomplete: motor function is preserved below the neurologic level; most key muscle below the neurologic level have muscle grade above 3. E: normal: motor, sensory function is normal. Poor: Have neurologic deficits, grade A, B or C.
Cervical spine traction was applied to reduce the fractures initially in emergency department by senior fellow and neuro exam documented afterward. 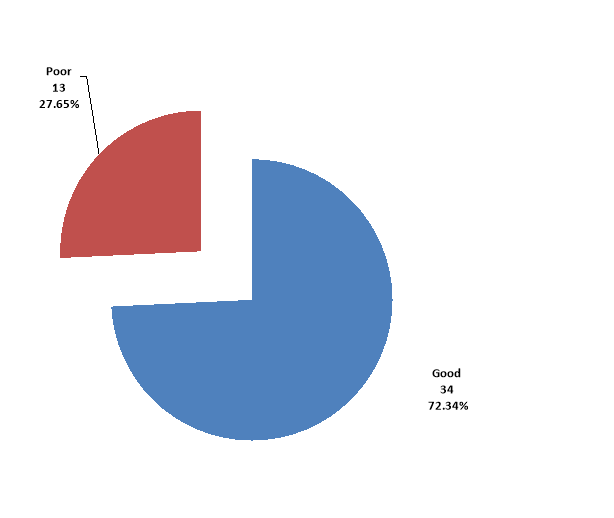 Final data were collected on preformed Performa and results were compiled. Confounding variable like age and gender were controlled by stratification. Data were analyzed on SPSS version 16.0. Frequency and percentage were computed for qualitative variable like gender and final outcome. Age was presented by mean and standard deviation. Stratification was done to control effect modification like age, gender to observe effect on outcome. RESULTS A total of 50 cases with recent history of trauma within 24 hours were included in this study. 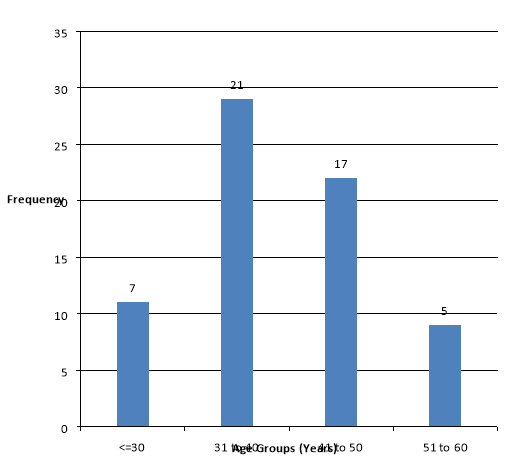 Most of the patients were between 31 to 50 years of age and the average age of the patients was 38.54±5.47 years (95%CI 37.45 to 39.12) as presented in figure 1 and table 1. 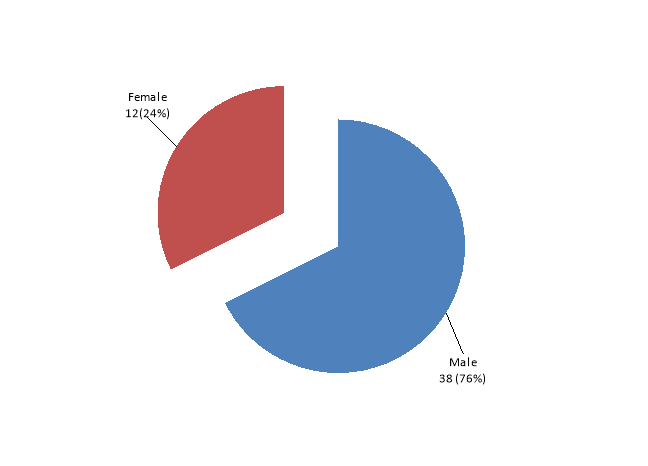 Out of 50 cases, 38(76%) were male and 12(24%) were female as shown in figure. We were able to recognize four pattern of injuries,Fracture 66%,fracture with dislocation20%,dislocation 12%,disco ligamentous injury2%. Most common mode of trauma was road traffic accident that was observed in 56% cases followed by fall 24% and assault 20% as presented in table 2. Younger patients (age less than 40yrs) did well (75%) compared to patients with age less than 40 years (60 t0 64 %).According to our study increasing age was associated with decreasing post operative out come. This was not significant however. Stratification of age on outcome. Proportion of the male having good outcome was higher than femal (73.68% and 66.66%. STRENGTHS AND LIMITATIONS: The strengths of our study included a prior sample size calculation scientifically, based on the prevalence of acceptable outcomes from previous studies. The single complete objective along with operational definitions and well clear predictors and outcome variables increases the worthiness of the study. This stringent inclusion and exclusion criteria along with a single acceptable criterion for the selection of outcome assessors decrease bias and helps in control for confounders. The study also included stratification for control of effect modification. Our study has few limitations, the selection of weak study design case series decreases the reliability, strength and worthiness of the study. The use of non- probability purposive sampling also decreases the generalizability of results applicability of study results to even similar geographical, cultural and demographic settings. The case series study also do not require a prior calculation of sample size, further the selection of few outcome variables limits the scope of the study. CONCLUSION: The results of our study are similar to previous studies showing high anatomical and functional outcome with acceptable differences related to geographical, cultural and quality of expertise and management differences. However considering the strengths and limitations of our study we recommend future studies should be conducted with hierarchy of study designs and multiple outcomes and settings with larger sample sizes to reach any firm conclusion.